Keep this routine handy for those days when you're practically tied to your desk. When lifeÂ gets hectic, your sweat sesh may be the first thing to go. I get that escaping to the gym isn't always feasible, no matter how good your intentions. That's why I put together a quick six-moveÂ routineÂ you can do literally without leaving your seat. 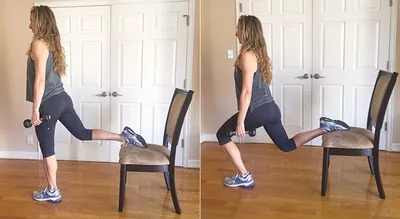 All you need is a chair and 30 minutes, and you can fit inÂ thisÂ workout thatÂ helps tone your body all over.Â Perform 10 reps of each exercise. Rest for 2 minutes. Then repeat the circuit two to three times. Get into a push-upÂ position with your hands slightly wider than shoulder width and place your toes on the seat of the chair. From here, bend your elbows and lower your body as close to the ground as you can before pressing back up. Place your hands behind you on the seat of the chair with your knees bent at a 90-degree angle, with your heelsÂ pressed to the ground and toes lifted. Your arms should be straight, but not locked. Slowly bend your elbows while lowering your bottom towards the ground. Go down until your arms make a 90-degree angle,Â then press back up. Stand two feet in front of the seat, facing away from it with your feetÂ shoulder-width apart and a medium-weight dumbbell in each hand. (You can skip the weights if you're at work.) Take your right legÂ back and place the top of your foot on the seat of the chair. From here, lower your body towards the floor. Make sure that your left knee doesn't go past your left toe. (If it does, tryÂ lengthening your stance). Press back up and repeat until you have completed 1o reps for that leg. Then switch sides. Get into a side plank position with your right elbow on the floor and your feet stackedÂ on the chair. Lower your hips towards the floor and then bring them back up. The distance they move will only be a few inches, but you'll feel it! Complete 10Â on your right side before switching to your left side. Lie on your back with right leg straight up in the air and your left heel on the chair. Press through your heel and glutesÂ to lift your hips until they'reÂ parallel. Slowly lower back down. When you've completed 10Â reps on your left leg, switch sides. Stand behind the chair. If you want, you canÂ hold aÂ medium-weight dumbbell in each hand. Fan one leg up and over the chair clockwise while engaging your core. Then fan the same leg over the chair counter-clockwise. That's one rep. If the back of the chair is too high for you, you can use the seat instead. Do 10 reps and switch legs.